Kirti singh was the last proud Chandel king who faced the massive army of Shershah and fought for months causing his death at the fort which changed the course of Indian history . Durgawati was the very beloved only daughter of Kirti Singh of Chandel dynasty who very carefully nursed and nurtured her as great war heroine of future history. Tiger hunting was her passionate hobby. Horse ,elephant riding and archery were her favorite sports .Father had perfectly groomed her a warrior girl. Married to Dalpati Shah of Gondwana, She was very unfortunately widowed soon after giving birth to a son. Sensing invasions from covetous neighbours, she raised a strong military force of sturdy tribals of Gondwana .First of all neighbour King Baaz Bahadur of Malwa thought her widowed single sad and frustrated. suddenly attacked her kingdom .The bold lady bravely fought and repulsed the attack.He attacked again and was decisively defeated never to dare again.Many other invaders attempted to subjugate her in vain.Lastly Akbar,attracted by the wealth and extreme beauty of young widowed Rani asked his notorious general Asaf Khan to attack her kingdom and arrest her for his harem. The daring widow Rani determined to save her liberty and honour , displaying rare courage defeated the forces of Akbar twice. The infuriated and frustrated emperor providing massive force of 50,000 sternly ordered Aasaf Khan to teach a lesson to the haughty lady and produce before him alive .With just 300 tribals soldiers,unduaunted she fought the mighty army of Akbar.Seriously injured.Yet quiet conscious of her honour arrest and forcible placement in the royal harem,The desparate bold Durgawati stabbed herself to escape Akbar’s captivity .Thus selfmartyred she immortalized herself. Since widowhood The gallant Durgawati had struggled and fought several wars for 15 years to save her kingdom and liberty. As a most courageous warrior she is unique,The greatest in country’s and world history. An inspiring model for the women of the world. 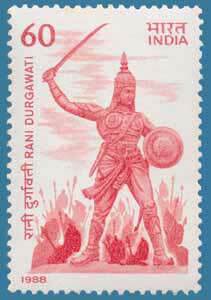 Durgawati was the last great lady of glorious Chandel dynasty and brightest star of Bundelkhand(Banda). Sadly Bundelkhand has forgotten her illustrious daughter.She has establish her high place in world history with her valour and deserves a worthy world class memorial at Kalinjar- ( Banda district). The historic capital of Bundelkhand and her first home.An urgent recognition of this paragon of womanhood is required by the thinking womankind of the world. 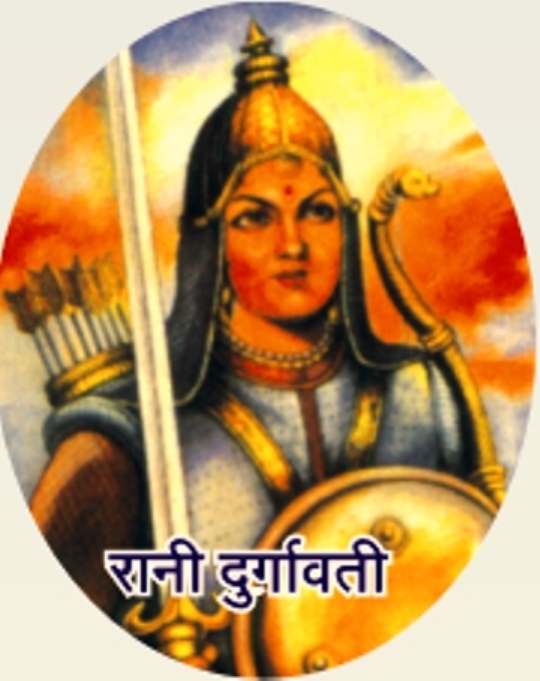 रानी दुर्गावती स्मारक समिति - Rani Durgavati Smarak Samiti.